Many of Blackstock’s works have been compiled in Blackstock’s Collections: The Drawings of an Autistic Savant, which we highly encourage you to pick up. Additionally, a few years ago, Brainpickings produced an excellent write-up of Blackstock’s work. 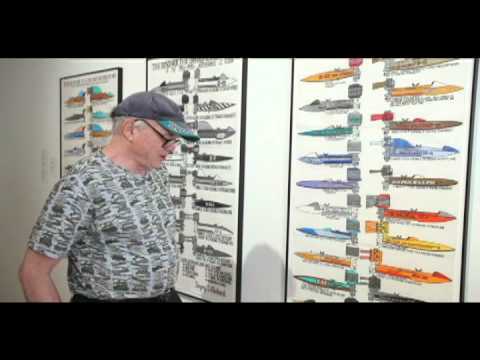 The above is a frame of a video of Blackstock speaking about an exhibition in which he took part (the wonderfully-titled “Memory in the Arts”) while wearing a shirt printed with one of his designs. For 25 years, Blackstock washed pots and played the accordion to support himself– all the while attending to his art. We’re so glad his work is now being celebrated.